Why Are Carrots a Healthy Food? Can You Boil Carrots to Make Baby Food? According to the American Academy of Pediatrics, vegetables are a good initial choice when you are ready to introduce solid foods to your infant’s diet, which generally comes around 4 to 6 months of age. Bridget Sweeney, a registered dietitian specializing in prenatal and family nutrition, recommends waiting until your baby is at least 6 months old before introducing home-cooked carrots because of the possible presence of nitrates. After this age, carrots offer a range of benefits for infants. One of the major benefits for parents is that they are cheap and readily available. Carrots provide dietary fiber, vitamin C, calcium and iron. They are extremely high in vitamin A, which promotes healthy eyesight -- hence the adage that carrots help you see in the dark -- as well as healthy skin, growth and resistance to infection. Because carrots are also a good source of the antioxidant beta carotene, which the body converts into vitamin A, these benefits are further amplified. With 3 g of sugars in every half-cup of carrots, they are one of the sweetest of all vegetables. This makes carrots a good choice when you are introducing solid foods to your infant because babies have a natural preference for sweets. Another benefit is the texture of well-cooked carrots, which are easy to puree, mash or chop into a consistency that your baby can handle. Carrots prepared for a 6- to 8-month-old child will generally need to be mashed or pureed, if necessary with the addition of a little breast milk or water. Babies age 8 to 10 months can eat carrots that have been well-cooked and cut into small pieces. Do not give infants chopped raw carrots because they present a choking hazard. Always peel the carrots and consider steaming rather than boiling them to help retain their nutrients. Although the American Academy of Pediatrics recommends introducing one single vegetable at a time, when your baby is used to eating carrots you can try combining them with other nutritious foods. You could combine mashed carrots and sweet potatoes, or blend cooked carrots with cooked cauliflower, broccoli or squash. From 8 to 10 months, try blending the cooked ingredients of meals you are preparing for the rest of the family that include carrots -- put a small portion of each ingredient aside before seasoning. A simple vegetable soup made with carrots, other veggies and broth will provide an array of nutrients, especially if you include green leafy vegetables. Cooked meat, chopped or pureed, is another nutritious accompaniment to carrots, providing protein and zinc. 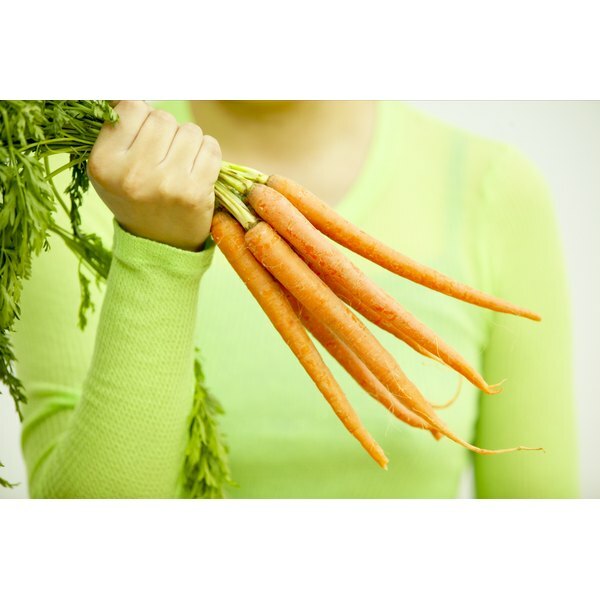 Are Carrots Good for the Skin? How Much Beta-Carotene Is in Carrots?